Had the opportunity to scope out the new Ballarat 70.3 course as part of Ironman’s course recce day Ironman Asia Pacific and Fluid Movements Triathlon put on last weekend. Had been to Ballarat a number of times, but it was the first time going in areas like Victoria Park and along Remembrance Drive as part of the course swim, ride and run. One thing I took away from the day was how the Ballarat 70.3 course is broken up by variety of terrain, and things to see and to negotiate in and around the historic war memorials scattered around the city of Ballarat. Came away much more excited about this new course and what it has to offer 70.3 competitors. 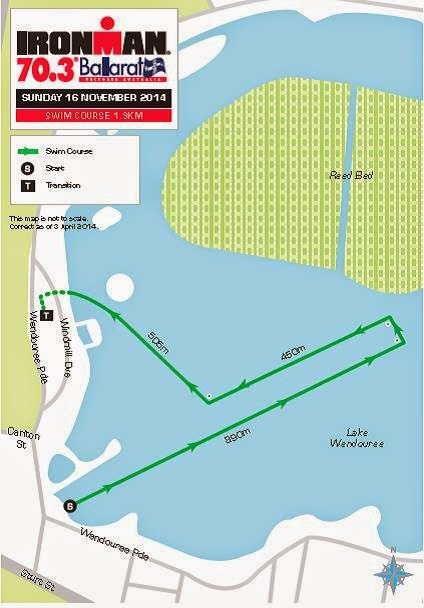 The swim leg is in Lake Wendouree. The start is some 500m ﻿﻿﻿﻿﻿﻿away from Transition, at the head of the rowing lanes where the historic Olympic Rings monument is from the 56’ Melbourne Olympics. The water is pretty clear and you are guided along the first 890m straight by the rowing lanes that are in the water. The great thing is there are guide ropes under the water that you’ll be able to follow to maintain a straight line along the course. There is a left hand turn, and quickly another, then you head back parallel from where you started for 450m. A final turn to the right and 505m into the shore and T1. The water temperature is around 15degrees, currently warmer than Port Phillip Bay, and its a shallow lake, so with some sun between now and race day it will likely warm up even more. On the day we found the temperature comfortable and it will be an easily navigated course. Not much chop at all, so swim sighting on the course will be easy. All in all pleasantly surprised and you should look forward to the swim leg in the lake. 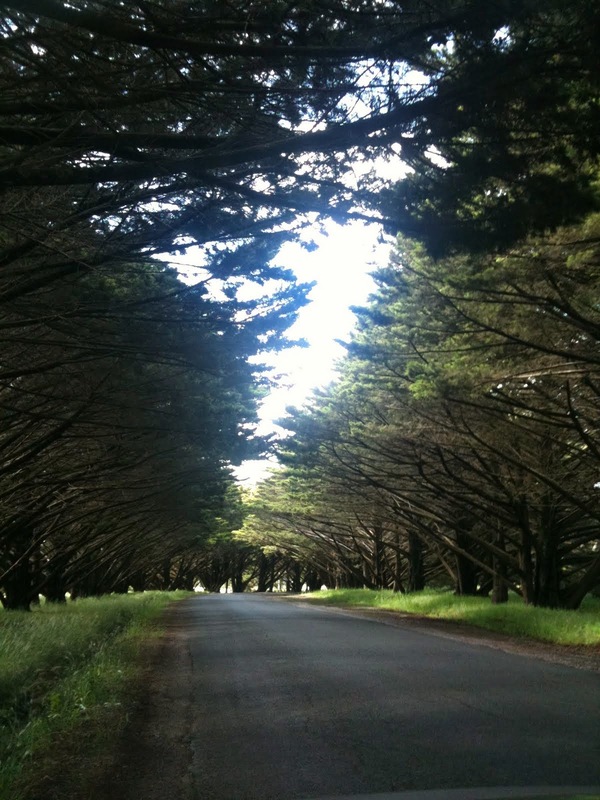 1) the 9km out and back section around Lake Wendouree. 2) The technical 4km section around the Victoria Park circuit. 3) The 32km out and back section along Sturt St and Remembrance Drive. anticlockwise past the swim start and around the edge of the Lake along Wendouree Pde to about three quarters the way around. The main aspect to note is negotiating 4 roundabouts along the way. The road surface is slightly grainy but wide and safe as you settle into your ride. Wind wise it’s relatively sheltered so should not cause too much issue. 2) The Victoria Park Circuit (4km) – On the ride this ﻿﻿was quite a fun section to travel along, with changeable scenery and narrow technical sections. There is a small section of re laid asphalt and some loose gravel on some apexes of corners. I am sure this will be swept, but it will provide a chance to break up the ride, change position out of corners and get out of the saddle. This section is again fairly protected from wind and is slightly similar to the Botanic Garden section in the Geelong 70.3 bike course, minus the hills. 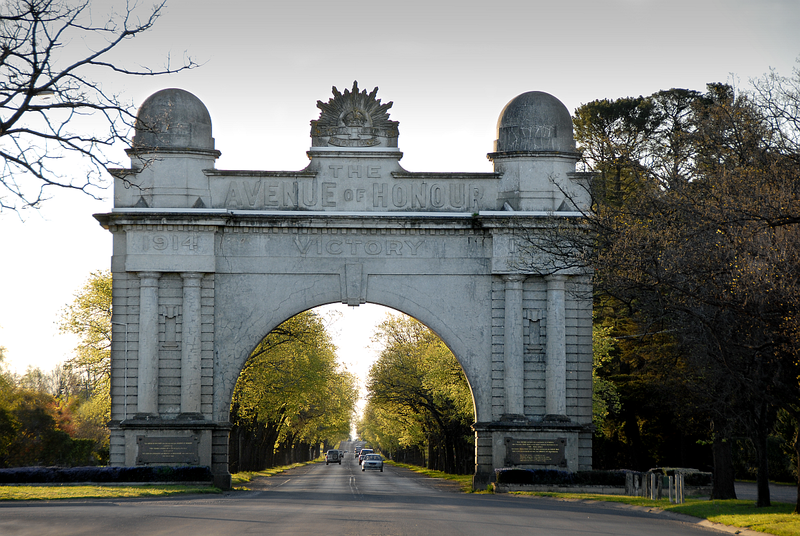 3) Out and back section on Sturt St / Remembrance Drive (32km) - Once you come out onto Sturt St you head in a westerly direction under the Arch of Victory and onto Remembrance Drive all the way to the far turn near Lake Burrumbeet. It is mostly flat but you will encounter long slight downhill sections as you head out, plus some very gentle rollers. The road surface is a little dead, so don’t expect an easy roll all the way. You will also likely encounter wind as it’s the most exposed part of the ride, with a cross tail wind on the way out and headwind on the return. Be careful to moderate your effort as you head out to the far turn, as you will have to come back into a headwind with slight uphill sections on the way back to town and onto the second lap. Once you come back into Ballarat proper, it's a left onto Wendouree Pde, past the transition area and back out for a second lap. This is a bike course that offers a bit of variety with technical sections and long straight roads with lots to see. 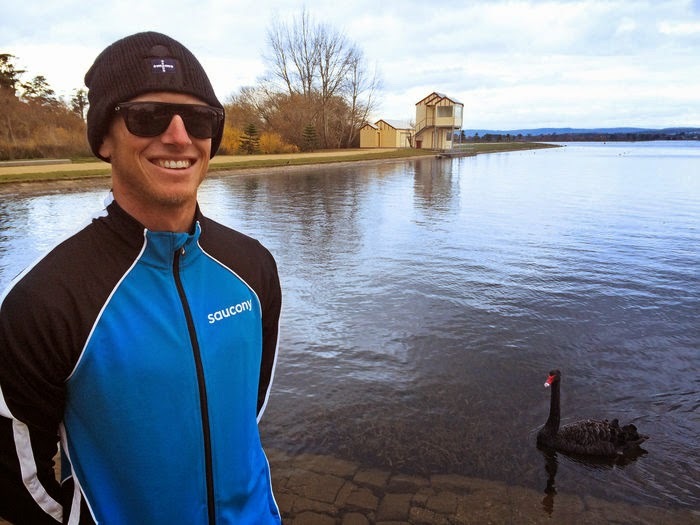 You will certainly feel the spectator’s energy as you ride around Lake Wendouree early in each lap. 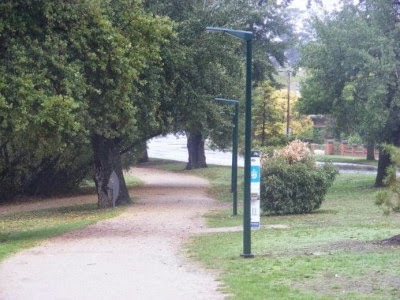 The run leg is situated in and around the Botanic Gardens and The Steve Moneghetti Trail that circles Lake Wendouree. There are 2laps around the run course, with the route commemorating and honouring champions and wars of the past as it encircles the War Memorial in the South Gardens as well as the North Gardens. The course then heads out and back around the lakes perimeter on the trail. Athletes will return to the venue precinct to complete their first lap before heading out for their second. The main things to note are that the course is well shaded with overhanging trees, which will be ideal in case of a hot day and a lot of it is on gravel trail, which will be good for the legs. It will be a fast course as it is mostly flat and follows the water line which will have a cooling effect. I think the spectator factor will be significant as you will be never far from the central race area. It will be an exciting run situated in the seat of Australian middle distance running in Ballarat. 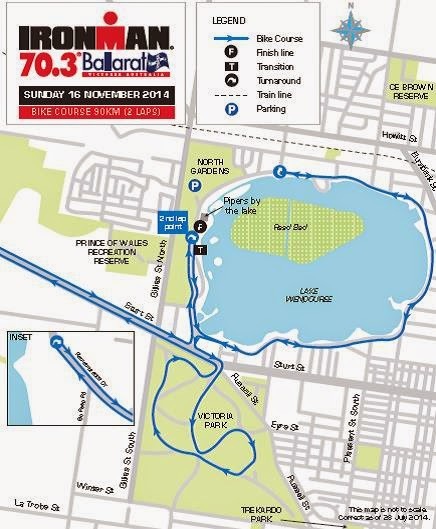 Are you ready for the #BattleofBallarat? We are excited and will see you up there on this great new fast course. Similar TT course as we've used at Elite and Masters Nationals ITT a few years back. The road surface on Remembrance Drive is blisteringly fast if you pick a good line. If you're lucky to get a slight westerly, or a stronger south westerly on race day, bike splits should be super quick. Good luck to those competing!